Stay connected and informed by signing up for the #INspirEDmath newsletter! 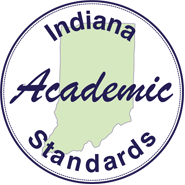 The Indiana Academic Standards for Mathematics demonstrate what students should know and be able to do in the areas of K-8 Mathematics; Algebra I, II, and Geometry; and higher-level high school Mathematics courses. Instruction in Mathematics provides vital content and skills for lifelong learning and problem solving in our increasingly complex technological world and engages students in the essential thinking skills and processes used across subject areas. This means that students who successfully master these objectives for what they should know and be able to do in Mathematics disciplines by the time they graduate from high school will be ready to go directly into the workplace or a postsecondary educational opportunity without the need for remediation. The 2014 Standards documents specifically list the standards for each grade or course at the high school level. The standards are broken into key areas called strands. The strands are the general areas of mathematics that students need to know and be able to demonstrate mastery. The Correlation Guides provide guidance and illustrate the correlations between the Indiana Academic Standards (2014) and the previous standards; Indiana Academic Standards (2006) and Indiana Common Core State Standards (2010). Teachers are encouraged to use this document as an instructional support tool. The Resource Guides highlight relevant Success Criteria, Academic Vocabulary, and the Vertical Articulation for each standard at the grade level or course. The resource guides are not exhaustive and are only for support. Please use the Mathematics Resource Guide Feedback to provide feedback and comments. The I-STEM Resource Network is a partnership of Indiana's public and private higher education institutions, K-12 schools, businesses, and government. It is dedicated to measurably improving K-12 student achievement in science, technology, engineering, and mathematics (STEM). PRISM is a free website that provides collections of online resources for Indiana educators in the fields of science, technology, engineering, and mathematics (STEM). Rose-Hulman Institute of Technology's Homework Hotline provides FREE math and science homework help to Indiana students in grades 6-12. For Elementary level: Type in " Indiana Elementary Education "
For Secondary level: Type in " IDOE – Indiana Secondary Mathematics "